This dungeon is a tricky one for new players because of the extra care you have to take not to drown while fighting the monsters. You will notice that under your character is a bar that represents how close you are to drowning. This bar gets filled by the air bubble areas that are in every room. If your bar gets depleted then you start to take damage due to drowning, the edges of the screen go red as a visual aid. Essentially as you progress through this dungeon you are moving from bubbles to bubbles. When you move into a new room, you should remember where the bubbles were in the room you just left in case you have to run back. The worst of all the enemies is the Ponies which sends red paralyzing bubbles out, the next are the blue (large and small) buggers that cast confuse. I really hate confuse! Item Drops - Coral Bow, Coral Venom Trap, Coral Silk, Coral Ring, Wine Cellar Incantation, Treasures, Moon Tarot Card. Thessal Phrase - If during your attack on Thessal and she slumps over, say the following "He lives and reigns and conquers the world". She will send out 3 pink spheres that you need only shoot once to get a chance at a gift which can be any of the items she normally drops. If there is just a few people who are making their way slowly, find the bubbles in a new room, remember where they are. Go back to them when you need to. If there is a large number of people in the dungeon and someone is rushing, wait until the rusher gets to the boss and teleport to him. Be aware though that it is very unlikely that an unpotted character will get anything. There simply is not enough time for you to get your soul bound damage on Thessal. If you are skilled at dodging and a bit daring you can rush to the boss. 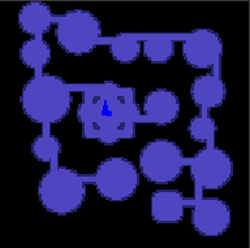 Any class can rush this dungeon but be careful of the blue guys that cast confuse and the ponies which paralyze. In a large group, your chances at a soul bound drop are still small because it is simply hard to get your soul bound damage in. Getting a drop is all about getting your soul bound damage. Its hard to do this on Ocean Trench because its become the trash dungeon of the game. Everyone flocks to it, one person rushes then a million TP and kill Thessal in seconds. If you are not a 4/8 melee or extremely lucky or even 1 second late getting to Thessal its almost impossible to get your soul bound damage which means no drop.